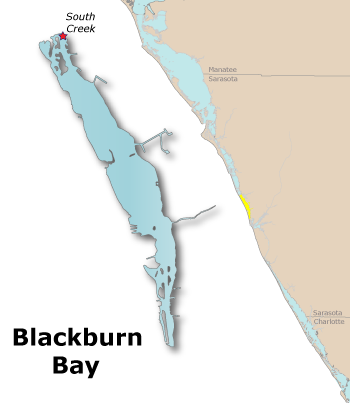 The overall health of Blackburn Bay improved in 2017. Chlorophyll a's lower concentration changed its rating from "Caution" to "Good". Nitrogen concentration decreased slightly, and is still in the “Good” range as it was in 2016. The mean value for phosphorus concentration decreased slightly as well, and is still well below the target level. Water Quality: Water quality in Blackburn Bay in 2017 was very good, with concentrations of both chlorophyll a and phosphorus below target values, and nitrogen only slightly above the target..The mean chlorophyll a level was 0.0073 mg/l, improved but still above the target concentration. The mean nitrogen level decreased to 0.3742 mg/l, only slightly above the target value of 0.36 mg/l. Phosphorus concentrations in the bay also decreased, with a mean of 0.0708 mg/l, well below the target (0.170 mg/l) and earning a score of “Excellent”.The mean for chlorophyll a was calculated as an arithmetic mean and the means for nitrogen and phosphorus were calculated as geometric means (per the Numeric Nutrient Criteria outlined in the Florida Administrative Code, section 62-302.532).